I decided to cool down by adding a new Autumn header to my blog. These 100 degree temperatures keep me inside where it's cool. There's lots of gardening that needs to be done like pulling out fried flowers, deadheading, and weeding. All I've gotten done is watering though. I've added a new cupcake painting to my Etsy store. That's what I was doing instead of gardening. If you're interested, you can check it out here. 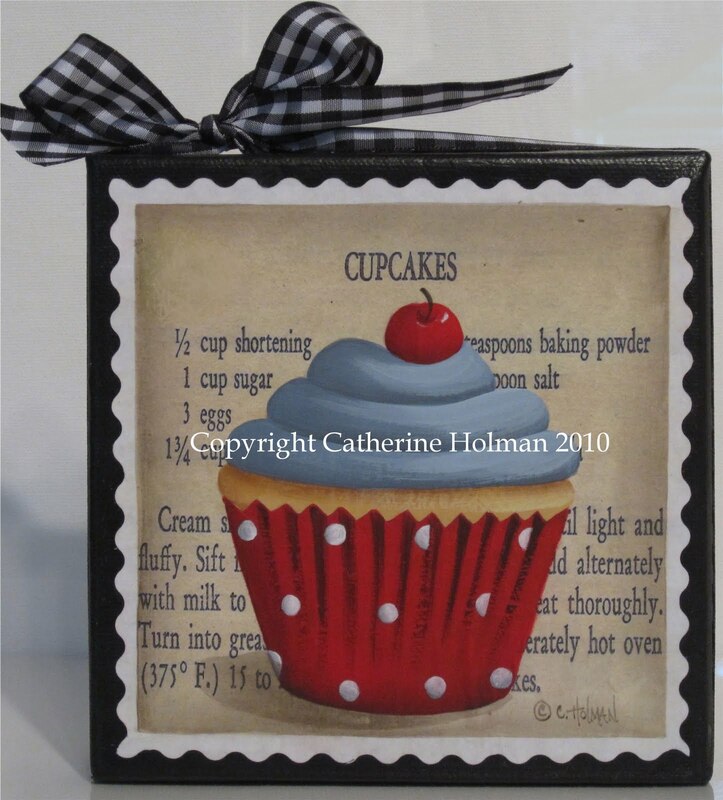 A colorful sweet cupcake topped with a bright red cherry is painted on top of an old worn and wrinkled recipe decoupaged to the top of a canvas. Swirls of blue frosting coat the top of this vanilla treat in a red and white dotted wrapper. What are you doing to keep cool? I don't think you can do anything to keep cool. So cute and this autumnal look to your home away from home is helping me stay cool. Actually, the weather will be cooling for the next few and then the heat wave that you've all been enjoying will hit with a vengeance next week. Ugh. Maybe I'll have to come up with an autumnal header soon. 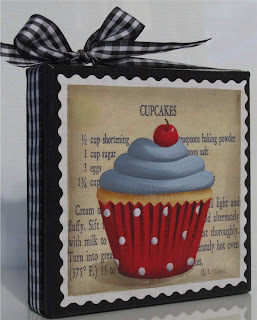 Love the cupcake against the recipe that way...sweet! So cute! Love the pillows in the previous post also, what a great place to sit! Cupcake wars is one of my new favorite shows and I think of your paintings everytime it comes on! 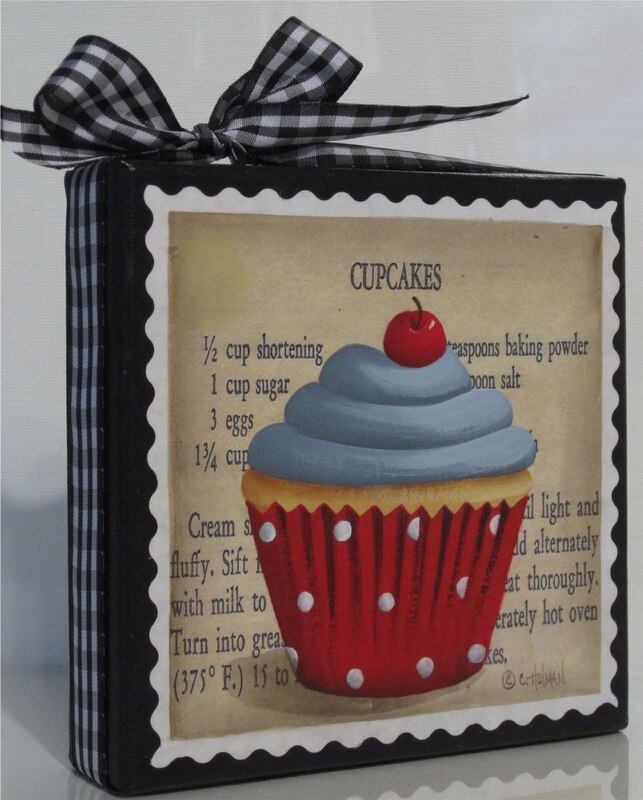 I love the cupcake painting ~ and your new header too! I've been staying inside trying to stay cool...painting and baking. Cathie, I love your new header!! I think we are all ready for Fall after all this heat! Love the cupcake and the header Catherine, I feel cooler already. Gee I love your new header...it's so full of fun and beautiful color.. I also love your cupcake piece...just darling!!! Lovely! Looks so yummy and inviting and I love the colours. Thanks for your comment on my blog Cathie! I sent an email to you at your yahoo address. Pretty as ever!I love the blue topping is it blueberry?, Yum. Your new header is delightful!